During one of the coldest nights of the year, a fortunate few were warming up inside the Walker Art Center. Those who braved the blustery weather were not only greeted with a new, more accessible entrance connecting the sculpture garden to the galleries and a new destination restaurant but also a huge new commissioned mural. 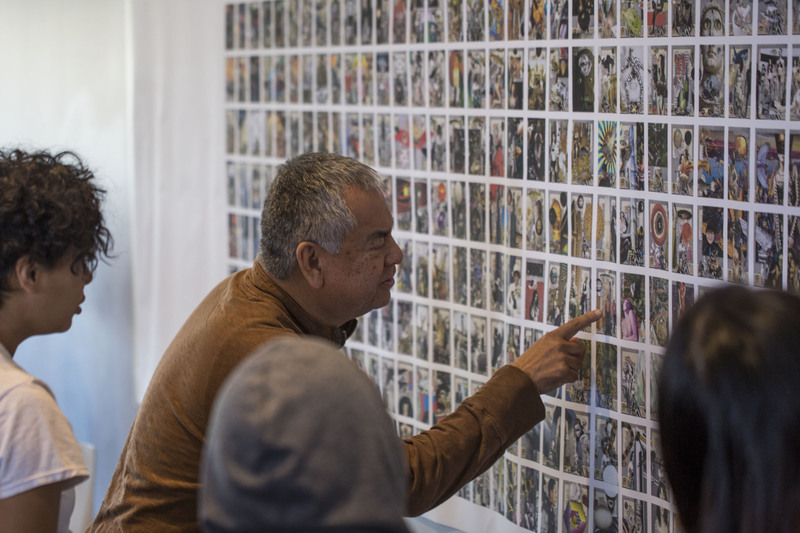 Created by Duluth-based, Ojibwe artist, Frank Big Bear, The Walker Collage, Multiverse #10 is 40 feet worth of collages made using images from art history, everyday Native American life, and the Walker’s permanent collection. It is a powerful visual anchor that draws visitors inside off of Vineyard Place. Just after the work’s December unveiling, one could not only visit the stunning mural but also receive a thorough education from a new set of experts of the work—members of the Little Earth Arts Collective, a cohort of youth based in the Minneapolis Little Earth Residential Community. The Little Earth Arts Collective didn’t become experts on the Frank Big Bear piece overnight. These Spotlight Talks were the culmination of a Walker program aimed at both helping Native youth see the arts as a viable career path and teaching valuable job skills such as organization and public speaking. Fifteen teenagers participated in the workshops, which ran for 10 weeks, from September until their final public talks during the December 1–4 Walker Open House Weekend. The trainings tackled skills like resume-building and featured one-on-one time with artists, including Big Bear. At one such workshop, participants were led in writing exercises by Twin Cities–based rapper and spoken word artist Alexei Casselle. He encouraged the teens to reflect on their personal identities by sharing his own background through a spoken word piece about being mixed-race and having both black and white family members. Impressed by Casselle’s spirited performance, the youth set to work creating their own identity pieces. 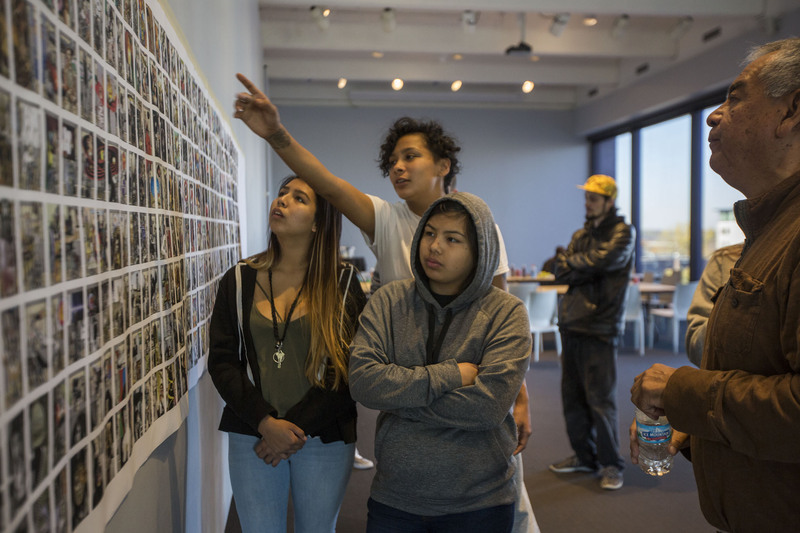 Through exercises like the six-word memoir and identity-mapping, they reflected on their identities as women, artists, students, siblings, tribal members, Natives, Minnesotans, and daughters. Casselle, an ally to Native people who’s been active in fundraising in support of water protectors at Standing Rock, was impressed with the Little Earth teens and their ability to share and reflect on their identities. The exercise would become the foundation for the confidence the youth would bring to the remainder of the program. The teen skills-building workshop program isn’t the first partnership between the Little Earth Arts Collective and the Walker. Throughout the years, they have worked with the Guerrilla Girls on their big Twin Cities “takeover” in 2016 and several other teen-focused programs through the Walker’s education department. Yet, the engagement between the Walker and Native youth has not always been so successful or long-lasting. One participant spoke about how uncomfortable she typically feels when inside the museum. She becomes self-conscious and worried about “being a person of color and wondering if I really belong here.” Another mentioned that the space “seems to be for white people or fancy people but not my family.” For years, many Native people have criticized the center for its lack of inclusivity for Native arts and people. One person trying to change this is Maya Weisinger, the Walker’s Access and Audiences Coordinator. Her role is a new one, intended to better integrate inclusive practices at the Walker, including those concerning the Native community. She began to build the partnership between the center and the youth arts collective by simply having coffee dates with Heidi Hafermann and Joe Beaulieu, staff members at Little Earth. She attributes the success of this most recent collaboration to this relationship and trust-building: “It is one of the most important things about creating a more inclusive space. I really believe there should be one person who just spends all of their time meeting with people. I think it often goes overlooked how powerful showing up and listening can be.” Together, the three arts and youth advocates designed a program for that would re-welcome Native youth into the Walker, pay them for their time and commitment, and create opportunities for the Little Earth residences to gain professional experience in the arts and culture field. But staff at the Walker and Little Earth are not the only ones calling the program a success. The youth themselves have been appreciative of the opportunity to work with the museum. Some say they joined the arts collective to meet people and make friends, while others saw it as an opportunity to get income and improve their financial situation. But many received even more than they bargained for. 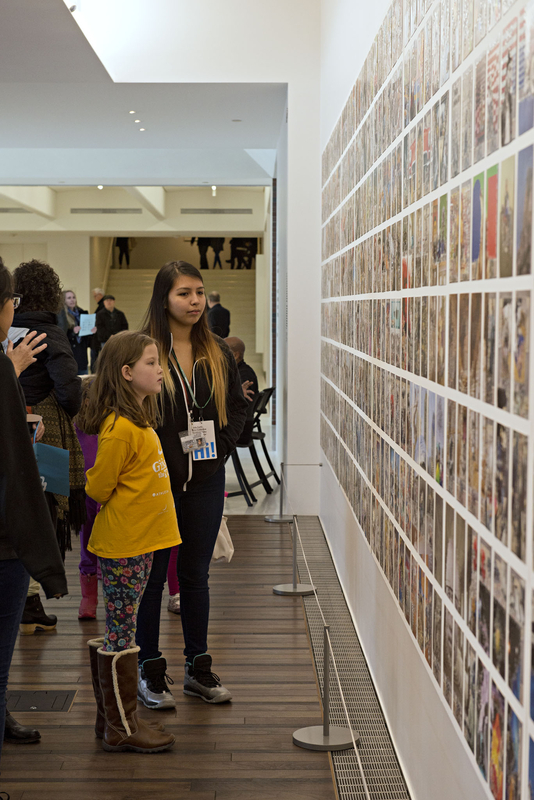 “After meeting Frank Big Bear and talking to him about his art, it just makes me want to meet more artists,” commented one Little Earth youth, who was surprised to find that she felt more comfortable inside the Walker and is now considering a career in the museum field. Like Weisinger, who has pledged to keep strong the relationships she formed with Little Earth, every party involved in the project was transformed by the passion and dedication exhibited by these youth. As an arts and culture professional, I, too, am more confident in the future of my field after watching these Little Earth teens excel in this art project. Toward the end of the program, I watched the youth give their spotlight talks about Frank Big Bear’s mural in the brand new Walker entrance. As they answered question after question and shared with the public their new-found confidence and knowledge about the piece, I grew emotional. It filled me with a tremendous sense of pride and awe to see these youth grow into community art docents. 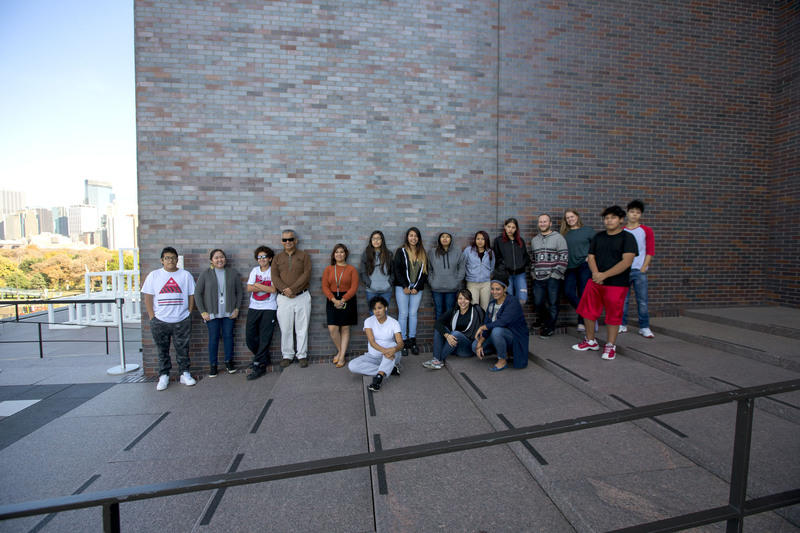 The future of Native arts and the museum field is as bright as the youth of Little Earth.